Dundas Castle celebrates 1000th wedding! Home > Weddings > Dundas Castle celebrates 1000th wedding! 11 Feb Dundas Castle celebrates 1000th wedding! 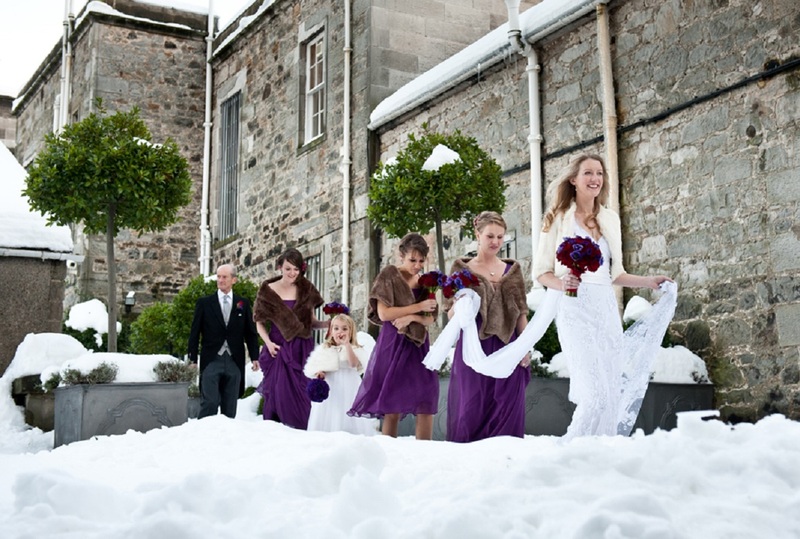 Dundas Castle was delighted to hold its 1000th wedding on 4th December 2010. It was an extra special occasion as not only was it a huge celebration for the new Mr and Mrs Pearse…and the Dundas team because it was the 1000th wedding… but because of the odds against the wedding happening with the unprecedented amount of snow fall in the week leading up to the wedding! Our Wedding Co-ordinator Lisa was the event organiser for the happy couple, Kate Maclaren and Simon Pearse, in the lead up to their wedding and was 100% satisfied that this was going to be wonderful wedding. It was only when the level of snowfall reached 4 foot and the police were warning drivers to stay at home that Lisa raised an eyebrow in concern! We have never had to cancel a wedding at Dundas Castle and thanks to the maintenance and office team who, armed with shovels and Lady Lydia and Sir Jack’s wellies, dug paths for cars and guests to manoeuvre around the estate – we know that the bride and groom were delighted that all but two of their guests were able to share in their special day despite the weather conditions. Thanks must also go to our Events Coordinator Morvern who drove to collect the Minister herself so that we could ensure that the wedding would take place. On the day of the wedding the estate could not have looked more beautiful. Not only was the bride sparkling, but the lawns looked spectacular as the snow glistened in the sun. The happy couple and their guests enjoyed a fantastic day and the Dundas team commented that the atmosphere was fantastic. Sir Jack was thrilled to be able to offer the bride a Champagne breakfast, magnificent fireworks display and elegant flambeaux as a wedding gift from Dundas to mark the 1000th wedding. Huge thanks must go to Prestige Scotland for the sumptuous Champagne breakfast and 21cc Fireworks for the spectacular fireworks display and flambeaux that looked even more magical due to the setting in the snow. Thank you to Elemental Weddings Photography for these photographs.